Meet the Samsung ARTIK family. Samsung Electronics unveiled a new family of system-on-chip (SoC) called ARTIK, one that is set to compete with Intel's Curie portfolio as the two giants tackle the growing Internet of Things market, one worth a potential $3 trillion (around £1.9 trillion, or AU$3.7 trillion) over the next few years. 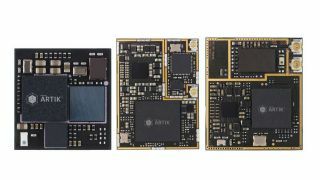 Three models have been introduced with more likely to follow: ARTIK 1 has the smallest footprint (12mm x 12mm) and packs a MIPS-based MicroAPTIV dual-core processor clocked at 250MHz and 80MHz respectively. There's also 1MB of memory, 4MB of flash storage, Bluetooth, a secure element and a 9-axis motion sensor. Its bigger sibling, the ARTIK 5, is just over twice the size, packs a dual-core ARM Cortex-A7 processor clocked at 1GHz paired with a Mali 400MP2, a configuration similar to what powered the four-year old Samsung Galaxy S2. The rest of the specs remind us of what we'd find in an entry level smartphone: 512MB of RAM and 4GB of storage. ARTIK 10, the largest of them all is also the most powerful model with an ARM-based octa-core that appears to be using a big.LITTLE architecture with four Cortex-A15 cores clocked at 1.3GHz and four Cortex-A7 clocked at 1GHz (similar to a Galaxy S4 smartphone variant from 2013). There's 2GB of RAM, 16GB of onboard storage, a full set of security features, Bluetooth connectivity as well as Wi-Fi and Zigbee. While the ARTIK 1 uses the low footprint Nucleus OS, ARTIK 5 and ARTIK 10 are both bundled with the Fedora-based Linux distribution Yocto 1.6; Windows 10 for IoT is likely to be compatible as well.